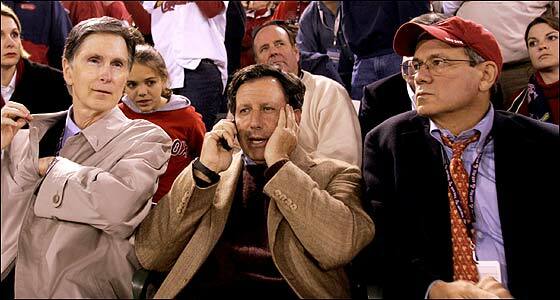 Within an hour of hearing that Larry Lucchino was leaving as CEO of the San Diego Padres, Tom Werner said he picked up a phone and called him, reaching him in his box at a Padres game. I'm trying to buy the Red Sox, Werner said. How'd you like to join me? That was the beginning, Werner said last week, of a partnership that later recruited its deepest pockets and ultimate point man, John W. Henry, after Henry -- having abandoned the Florida Marlins when he couldn't get sufficient backing for a new ballpark in south Florida -- decided the price was too high for the Anaheim Angels and elected to seek a greater prize, the Red Sox. Henry expressed the mandate assumed by the new owners from the time Major League Baseball approved the sale of the Sox from the Yawkey Trust Jan. 16, 2002 in a resort hotel in Scottsdale, Ariz.
"Win a World Series? That's not my choice, it's my role, it's my obligation to New England," he said. "That's what I've been charged with. When you bid on the Red Sox, the challenge you're undertaking is nothing short of winning the World Series." From Feb. 27, 2002, the day the sale closed, to Oct. 27, 2004, a span of just 32 months, this unlikely trio made up of a Hollywood producer, a Washington lawyer, and a onetime Arkansas farmboy turned billionaire money market manager accomplished what their predecessors were unable to do in the previous 86 years. In so doing, they also fulfilled their pledge to become fully integrated in the community, a promise that had been greeted with skepticism by those -- and there were many -- who viewed the new guys as carpetbaggers. Henry and Lucchino both bought homes in the Boston area. Werner during baseball season made the Los Angeles-to-Boston commute a staple of existence, spending nearly half of every month in town. Together, they transformed the face of ancient Fenway Park, placing seats on the Green Monster and the right-field roof, expanding concourses, and creating a nightly street festival on Yawkey Way, all strokes of brilliance from architect Janet-Marie Smith that made longtime fans wonder why no one had thought of doing so before. They also hired a Lucchino protege, former PR intern Theo Epstein, who had followed Lucchino from Baltimore to San Diego, enrolled in law school at Lucchino's behest and learned the baseball business as an aide to Padres general manager Kevin Towers, as the youngest GM in the major leagues. The end result? Record attendance, record TV ratings, and a World Series championship trophy residing at 4 Yawkey Way. Henry, it turns out, not only spoke softly ("He's so soft-spoken," Astros owner Drayton McLane said, "that I have to concentrate when he speaks so I can hear him"), but wielded a very big stick, one that took down the "Evil Empire," as Lucchino once had colorfully described the New York Yankees, a jab that struck a nerve with Yankees owner George Steinbrenner, a longtime adversary. Not that Lucchino was fully persuaded the Sox would trump the Yankees, especially when the Bombers led the Sox 3 games to none in the American League Championship Series and had a lead and fabled closer Mariano Rivera on the mound in Game 4. Remember Epstein alluding to certain club officials preparing their concession speeches? That was Lucchino, who allowed his frustration to pour forth by slamming the walls of his suite in frustration (unlike Yankees pitcher Kevin Brown, who broke his hand punching a clubhouse wall, Lucchino had the presence of mind not to close his fist), then began drawing up a statement congratulating the Yankees. Those words, of course, proved unnecessary when the Sox staged the greatest comeback in major league history, then swept the Cardinals in four straight games in the 100th World Series. Overcoming long odds are not an unknown to Lucchino, who grew up on the streets of Pittsburgh, played basketball at Princeton University with Bill Bradley, and after being hired by famed trial lawyer Edward Bennett Williams, assisted on the Watergate hearings with another young lawyer of promise, Hillary Rodham Clinton. For 37 days in 1986, Lucchino was confined to a hospital room at the Dana-Farber Cancer Institute after undergoing an experimental bone marrow transplant for an advanced form of lymphoma that had left his immune system defenseless. Upon his discharge, the first thing Lucchino did was arrange to go to a game at Fenway Park. Lucchino, who won a Super Bowl ring with the Washington Redskins and a Series ring with the Orioles in 1983, wound up in San Diego at the end of 1994, just as Werner was ending what had been a frustrating first venture into owning a ball club. Werner had been vilified as the man responsible for ridding the Padres of most of their top players, moves he insisted he had to make to bring the Padres' payroll in line with the club's revenues. "There aren't many people as unpopular as I am right now," Werner said at the time, and with the Padres owning the worst record in the majors at the time he sold the club, not many in San Diego were sorry to see him go. But Werner, one of the most influential advocates of the wild card -- the means of entry for the Sox into the playoffs in each of their last four postseason trips -- was determined to try again, and this son of a Manhattan lawyer who grew up a Yankees fan found his calling in the Red Sox. He found his financial angel, and kindred spirit, in Henry, who grew up idolizing Stan Musial. When Henry wasn't managing hedge funds that had made a onetime college dropout a fortune, or singing lead vocals in his rock band (he has drumsticks from Ringo Starr in his Florida home and counts Aerosmith's Steven Tyler as a good friend), he was pursuing his passion for a game that had captured his soul as a child. Henry was a limited partner in the Yankees and owned, prior to the Marlins, a minor league team in Tucson before joining forces with Werner and Lucchino. The titles -- Henry as principal owner, Werner as chairman, Lucchino as CEO -- were secondary to the state of mind they brought to Boston. "I certainly identify with the fans," Henry said, "because I've been one my entire life."